The Flat-Club blog is back again for another of our new feature spotlights! Last week we covered the big improvements made to our clubs, and this week we’re going to tell you how we’ve changed up one of the most important aspects of our site: posting your flat. Discounts for longer stays. We’ve made it easier and more rewarding to discount for longer stays. 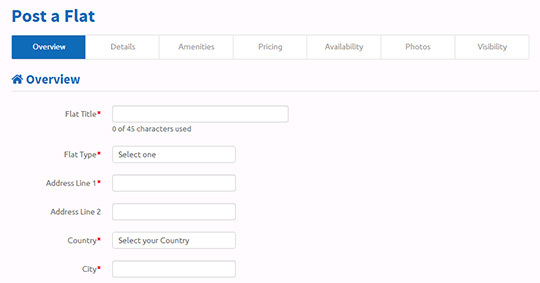 You can set a discount for guests who stay 60+ days, and a higher discount for guests who stay 90+ days. Best of all, when you offer discounts for longer stays, you will be improving your rank! When you’ve improved your rank, that means you’ll show up higher in the search results - which means more bookings, with trusted Flat-Club guests who on average book at least one month! Limit visibility to only trusted guests. Our hosts now have even more ways to make sure their flat is seen by only people they want to rent to: we have updated our visibility options for hosts. Now you can choose to make your flat visible to everyone, only to club members, or only members of specific clubs. Providing hosts with even more one-on-one account management. Every single host on our site will have an account manager that they can contact with any questions or requests they may have. 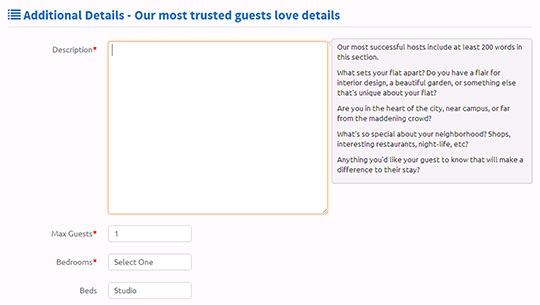 Our account management team is dedicated to helping hosts get bookings & make the most out of their listing. Tips & advice while posting your flat. Renting out your property takes time and thought, so you might want some guidance. That’s why we’ve added handy tips to help you along the way. In addition to the tips you’ll receive during the actual process, we have a few past blogs that will help you make the most of your flat. If this is your first time hosting start off with our overall guide to hosting, and how to best utilize your flat posting. That isn’t all we’ve added, either - also new to Flat-Club are cleaning fees, key delivery specifications, and house rules. When you include how you prefer to exchange keys with your guest, they will be sent your answer along with your contact information once the booking has been confirmed. We’ve also increased the amount of information you can share about your flat in your description, including number of bathrooms, number of beds, maximum stay preferences, and flat size. Hopefully that means less questions about your flat, and more speedy bookings that work best for you & your guests! We’ve also recruited more photographers to take free photos of your flat; as you know, photos are the key to an excellent flat posting so get in touch with us to take advantage of our free photography service, now servicing even more hosts! Making it easy & pleasant for you to post your flat is incredibly important to us at Flat-Club, and we hope that you’re pleased with the improvements that we’ve made. Let us know what you think! If you want more info on hosting, check out flat-club.com/hosts, or email us at hosts@flat-club.com. We’re so excited to highlight the launch of our new club pages, and the many more improvements we’ve made to our clubs. Are you still not a club member? Search through over 400+ clubs on our site, and join yours now! Once you’ve joined, come back here and read all about the awesome new benefits you receive. Enhanced trust. Joining a club makes your reputable networks work for you; you build trust as a host and as a guest when you become a verified member of one of our clubs. We verify every club member’s status through our sophisticated algorithm, so if someone is a member of a university club on Flat-Club, you can be sure that they truly attended. This works to give peace of mind to both hosts and guests alike. Being a club member is completely free, and has so many benefits - there is no reason not to join up. Access to member’s only rentals. You’ll notice there are two maps on your club page. One of them shows you all of the flats within your club - across the world. So wherever you’re going, you can stay with a member of your network. Similarly, as a host, you can choose who can see your posting. When editing your flat, you can change the visibility to be available to everyone, only available to club members, or exclusively available to members of certain clubs. That way, you’ll know that when you get a booking request it is coming from someone you’d be happy to host. Member savings. While joining a club on our site is completely free, by doing so you’ll save money. When you’re a club member, you can expect better prices on our service fee, with every booking you make. We’ll be implementing more discounts related to club membership in the near future, but in the meantime, it might benefit you to grow your club...hint, hint. Locations right where you need them. Remember the two maps on the club page? The other one one shows you flats that are nearest your university’s campus. So, whenever you want to come back to campus, you can stay nearby. We’ve got you covered whether you need to plan for accommodation during a reunion, studying abroad, or if you’re visiting family and friends and want to stay with someone in your circle. A tailored Flat-Club experience. Each and every one of our clubs has their own page now. This provides you with the ultimate in tailored experiences on Flat-Club; and it’s only going to get better as we add more! Find flats within your network, find flats near your campus, and more. We’ve also came up with a cool algorithm that sorts you into the right clubs, based off of the information in your Facebook profile. For instance, if you share your university information on Facebook, when you link the two accounts together, Flat-Club will automatically add you to your university’s club! We’re particularly happy with how all the new features within our clubs turned out, as clubs are the cornerstone of our service. It’s our clubs that make us different, so any change to them is a change to our foundation - we’re very pleased with these changes, what do you think? We’re excited to announce that we have completely re-launched our site - as you probably have noticed already. New logos, fresh design, new features that you’ve asked for - all built on brand new technology! We’re looking forward to your feedback, and a big thank you to those of you who have been with us since the beginning. We’re so proud of what we have accomplished, and thankful for our members who have stuck it out with us. We have relaunched the site with many improvements (nice color palette, huh?) and added features that you have asked for. We’ll be highlighting some of these features on the blog in the coming weeks, & the first blog is already up! Read more about our clubs here. We’ve given the most attention to our clubs, including new club pages where you can find club-specific information, the ability to search for a club, and the chance to integrate your Facebook profile with Flat-Club (even if you've signed up via email) so you can automatically join the networks you’re connected to on Facebook. We’ve also made posting a flat easier than ever. The process is more intuitive, more user-friendly, and we have added a few tips that can help you make the most of your place. Now, if you can’t finish posting your flat in one go, you can save your progress whenever you like & return to your posting later. Also, we've improved the technology behind our search engine, and added some important information to our search results page, so you’ll have more information on a flat you’re interested in before you even click on it! Over the next few weeks, we’ll be highlighting some specific new features on the blog. Even more is improving in the coming months, and we’ll keep you updated on every new feature here, on Twitter, and on Facebook. We're very happy with these improvements, and excited for the future where we will continue to better our service with your feedback & support.